"Today’s not about THAT fight." UPDATED info on this situation (with even more video) here at Ednotes. 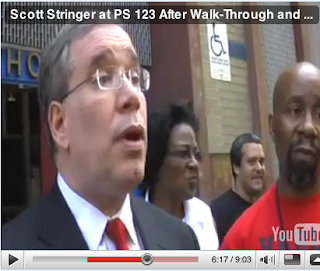 Ednotes just put up a new video of the PS 123 demonstration and walk-through July 10th with Manhattan Borough Pres. Scott Stringer. But, they haven’t been on the case, and they’re only going to get on it if it becomes politically expedient. “If Bloomberg and Klein run the schools for 7 years, they’re in charge of every school, how do they manage to push the idea of a charter school, which basically absolves them of the responsibility. In other words, isn’t that an admission of their failure if they say that public schools are failing and they need charter schools. Isn’t there a contradiction in that very concept? Stringer dodged it, claiming his purpose that morning was to see what’s going on at 123 and try to figure out a solution. The fight that Stringer sidelined at Scott’s question is the fight, no two ways about it. And it’s going to have to get much louder before elected officials like Stringer get down with making quality facilities equal for all public school kids.